Despite the more than 80 years and far too many wars that separate today’s viewers from Lewis Milestone’s All Quiet on the Western Front, the film’s visceral portrayal of the horrors of war still resonates powerfully to this day. If other moments from the film can feel a bit stilted and stylistically flat to modern audiences, they are far surpassed by the raw graphical power of Milestone’s imagery. All Quiet on the Western Front follows a group of wide-eyed German school from idealism and dreams of glory to disillusionment and the grave. The episodic adaptation of Erich Maria Remarque’s classic antiwar novel allows Milestone to sketch brief and self-contained sequences that speak powerfully and directly to specific experiences of war. In one such scene, a battalion battles cabin fever as they’re forced to remain trapped in a small shelter during interminable enemy shelling. In another, a soldier spends a tormented night in a foxhole next to the body of an enemy he’s slain. The tone of the film slingshots dramatically as these sketches accumulate—some are even comic and tender—which only serves to highlight the vast array of experiences encapsulated within war, as well as the influence All Quiet on the Western Front has had on our cinematic understanding of them. Unfortunately, the film does occasionally fall prey to melodrama and didacticism that has not aged well, but that spirit is always quickly replaced by moments of great visual drama. The film’s stunning battle sequences, for example, demonstrate an understanding of the lessons of Sergei Eisenstein and Soviet montage, creating tensions in the temporal rhythm and graphical qualities between and among shots. 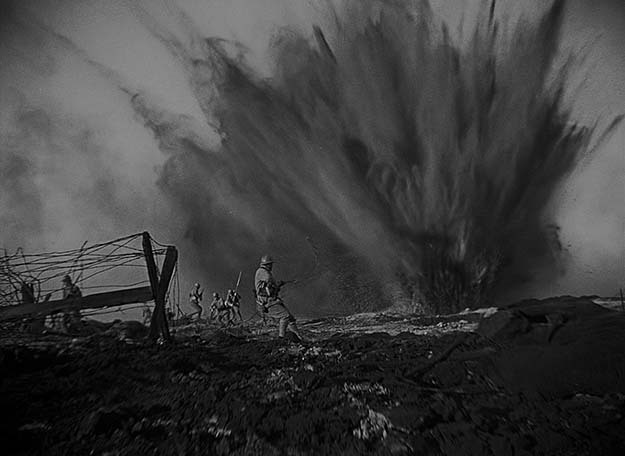 As if to counter the film’s own tendencies towards speechifying, it ends with a gorgeously simple and evocative image, one with more to say than the whole of the film’s screenplay: a glimpse of soldiers marching to war, glancing over their shoulders towards the camera, superimposed over an image of a field littered with crosses.